Top seed Novak Djokovic cruises to a 6-2 6-1 victory over Roberto Bautista-Agut in the third round of the Mutua Madrid Open. Defending champion Andy Murray will join 16 of the world's top 30 players to compete at Queen's next month. Milos Raonic progresses through to the second round of the Madrid Masters with a straight-sets victory over Thomaz Bellucci. Rafael Nadal sets up a Monte Carlo Masters semi-final with Andy Murray by knocking out last year's winner Stanislas Wawrinka 6-1 6-4. Andy Murray breezes into the semi-finals of the Monte Carlo Masters with a 6-2 6-0 victory over Milos Raonic. British number one Andy Murray admits that he was not at his best against Benoit Paire. Nick Kyrgios moves into the world top 20 after beating Milos Raonic to reach the semi-finals of the Miami Open. Kei Nishikori comes from a set down to battle past Gael Monfils and into the semi-finals of the Miami Open. World number one Novak Djokovic thinks that men should be awarded more prize money than women, after a row was sparked by comments from Indian Wells chief executive Raymond Moore. Novak Djokovic annihilates Milos Raonic 6-2 6-0 in the final at Indian Wells to pick up a record-breaking fifth title. Roberto Bautista Agut continues his impressive start to 2016 with victory over Victor Troicki in the final of the Sofia Open. Milos Raonic admits that Friday's Australian Open semi-final defeat to Andy Murray was the most heartbreaking loss of his career. Andy Murray insists that his poor head-to-head record against Novak Djokovic will play no part in Sunday's Australian Open final between the world's top two players. Andy Murray outlast Milos Raonic in five sets to reach the Australian Open final for the fifth time in seven years. World number one and defending champion Novak Djokovic beats Roger Federer in four sets to reach the Australian Open final. Andy Murray will take on Milos Raonic in the semi-finals of the Australian Open after the Canadian overcame Gael Monfils in four sets. Andy Murray reaches the 18th Grand Slam semi-final of his career following his four-set victory over David Ferrer at the Australian Open. Fourth seed Stanislas Wawrinka is knocked out of the Australian Open by Milos Raonic, who battled to victory in five sets to reach the quarter-finals in Melbourne. Top seed Roger Federer is beaten 6-4 6-4 by Milos Raonic in the final of the Brisbane International. A back injury forces Canada's world number nine Milos Raonic to withdraw from the upcoming Paris Masters. Rafael Nadal sees off Milos Raonic 6-3 7-6(3) to advance to the quarter-finals of the Shanghai Masters. Rafael Nadal overcomes Ivo Karlovic in three sets to reach the last 16 of the Shanghai Masters. Milos Raonic sees off the threat of Roberto Bautista Agut to books his place in the last 16 of the Shanghai Masters. Viktor Troicki beats Milos Raonic in straight sets to reach the second round of the China Open in Beijing. Feliciano Lopez acknowledges that he will have to be at his best to secure a surprise win over world number one Novak Djokovic in the US Open quarter-finals. Spanish veteran Feliciano Lopez stuns Milos Raonic with a 6-2 7-6(4) 6-3 victory to reach the fourth round of the US Open. Mardy Fish insists that pulling out of his US Open match with Feliciano Lopez with cramp was never an option as he brought his professional career to an end in New York. Feliciano Lopez insists that opponent Mardy Fish was the better player, despite outlasting the American over five sets at the US Open. Milos Raonic earns a place in round three of the US Open with a four-set win over Fernando Verdasco. Milos Raonic seals his place in the second round of the US Open by beating Tim Smyczek in straight sets. 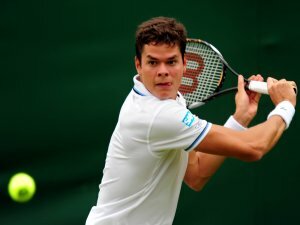 Milos Raonic endures another early exit from a tournament by losing in straight sets to Feliciano Lopez in Cincinnati. Ivo Karlovic wins the battle of two of the biggest servers on tour by beating Milos Raonic 7-6 7-6 in the second round of the Rogers Cup. Richard Gasquet reaches the Wimbledon quarter-finals with a four-set victory over Nick Kyrgios. Twenty-sixth seed Nick Kyrgios believes that he is in for a "tough" match against France's Richard Gasquet in the fourth round at Wimbledon. Nick Kyrgios: "I don't fear anyone"
Australia's Nick Kyrgios insists that he does not "fear anyone" after coming from a set down to beat Milos Raonic at Wimbledon. Australia's Nick Kyrgios comes from a set down to beat seventh seed Milos Raonic in the third round at Wimbledon. France's Richard Gasquet is through to the fourth round at Wimbledon after cruising to a win over 11th seed Grigor Dimitrov. Relive with Sports Mole all the action from day five at Wimbledon as Novak Djokovic, Stan Wawrinka and Serena Williams were all competing. Nick Kyrgios believes that Wimbledon third-round opponent Milos Raonic possesses the best serve in men's tennis.